Is Removing Charge-offs From Your Credit Report Possible? A charge-off on your credit report can be tricky business. How do you approach the creditor or collection agency? Is it impossible to remove a charge off from your report? We’ll offer some ideas on the first question. And yes, it’s possible to remove a charge-off from your report. However, you’ll need to meet a few criteria. First, let’s look at a few stories. While in college, Joe K. signed up for two credit cards with $1,000 credit limits. Before he graduated, he’d maxed out the cards, and was unable to pay the balances. Suzie Q. bought a car with an auto loan when she landed her first job. A year after being hired, the company went out of business, leaving her jobless and unable to continue to pay her car payment. Other bills continued to stack up. Bob and Kelly B. bought their first home in 2005, and were elated to finally have a piece of the American dream. In 2008, they both lost their jobs and were unable to pay their mortgages. Like Suzie Q., they couldn’t pay their other bills, including medical expenses not covered by health insurance. In each of the above scenarios, the results of each consumer’s financial woes were a slew of delinquent payments that led to charge-offs. These charge-offs were listed on their credit reports, making it difficult (if not impossible) for the consumer to secure future financing of any type. Do you have charge-offs or negative items on your credit report, and want them removed? Our research of the top credit repair companies can help. You may have found yourself in any one, or a combination, of the above scenarios. If you haven’t, you should thank your lucky stars. Improving your credit following a charge-off can be challenging, to the say the least. To be clear, charge-offs, which occur when creditors turn over delinquent accounts to collection agencies, do not relieve the debtor from paying off the debt. Charge-offs allow the creditor to get the delinquent account off its balance sheet; it becomes the collection agency’s duty to recoup the loss. If you have accounts that have been charged off, don’t be anxious. There are steps you can take to dig yourself out of the hole. Here, we’ll go over charge-offs, what leads to them landing on your credit report, and how you can remove them. We’ll also note the illegitimate schemes with which agencies often snare consumers who are desperate to have charge-offs removed. So, roll up your sleeves, and get ready to learn some of the basics about charge-offs and their effects on your credit. Americans are still recovering from the 2008 financial collapse, which left them without jobs and unable to cover their debts. Add to that those who were struggling with debt problems before the crisis, as well as those who went into debt well after it, U.S. consumers are carrying more than $13 trillion of debt. Left unpaid, any of these debts can lead to charge-offs. For many, the domino effect of not paying these debts have left their credit in shambles. It may have started off as one missed payment, then two. Before many know it, their continued delinquencies have led to their creditors giving up hope that they would ever pay off their balances. A charged off debt is typically one that is at least 180 days overdue. After that span of time, the company cannot reasonably expect to collect payment on the debt. So, the debt is ‘charged off’ on the company’s balance sheet. After the creditor charges off the account, it heads to a collection agency (like AFNI Collections), where the situation grows to be even more of a headache. Constant phone calls at your home and/or office are par for the course when delinquent accounts hit a debt collector’s desk. Note: bills from creditors that don’t report to credit bureaus on a monthly basis won’t hurt your credit score until the debt is turned over to a collection agency. 1. If you find yourself in a situation in which you can’t pay your debts in a timely manner, be proactive. That means contacting the creditor immediately, not after you fall behind. The creditor may be able to restructure your loan, or adjust your payment arrangement. 2. If that doesn’t work, and you still end up with a charged off account, contact the collection agency. Your chances of working out a payment arrangement increase. Collection agencies are generally more willing to settle the account for an amount that is less than the amount owed. Before you make that call, gird your loins and swallow your pride. This is not the time to be defensive or argumentative. 3. Some observers advise you contact the original creditor to start negotiating the removal of the charge-off. The purpose is to persuade the creditor to remove the charge-off in exchange for your proposed payment. Other observers note that once the account is in collections, you’ll have to negotiate with the collection agency, not the original creditor. As we’ve said, failing to pay your bills on time can wreak havoc on your credit. According to FICO data, one missed payment could cause a 780-credit score to plunge 90 to 110 points. This analogy applies to consumers who have never missed a payment on any credit account. Understand that the Fair Credit Reporting Act provides that collection accounts can only stay on your credit report for seven years. You’re cautioned, however, to not just sit back and wait for delinquent accounts to fall off of your report. Take action. Contact a credit repair company if you believe a charge off or delinquent account item on your report to be erroneous. 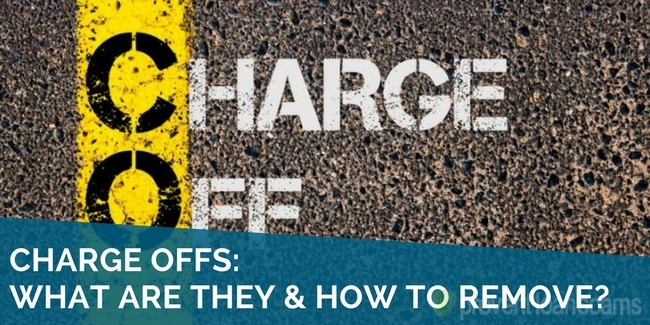 Start taking the steps we’ve noted to have charge-offs removed as quickly as possible.